2). Number two is subjective. Basic principles of this medical system have application of understanding to find the disease and in person. Both can be classified and genralized to cure the disease. Without that no one can get comfort and life. They symptomatically do it and nature helps on each and every spot. Everything you see is to follow health guidelines for only comfort to life. No one knows all about health and nature. It is only people's imagination and experience to work for life and never get tired. 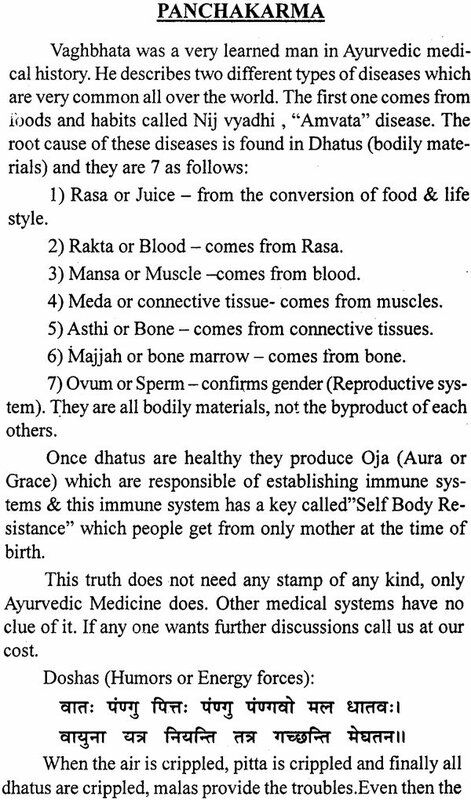 7 Vedas, the oldest epic of human history, tells about health and how to carry life successfully. 4) Soul, Human life comes out of 9 elements. Nature controls everything in this world, whether living or non living. Ayurvedic Medicine is a top medical system which deals with people's health. Panchkarma is one of the branches which helps to maintain health to live long in this world. It is a procedure of five different steps to maintain and adjust the body (mind, body, emotions, and spirit ). Ayurvedic medical doctors are trained to perform Panchkarma and know what medicine to use. Ayurvedic Medicine always uses scientific and technological methods. 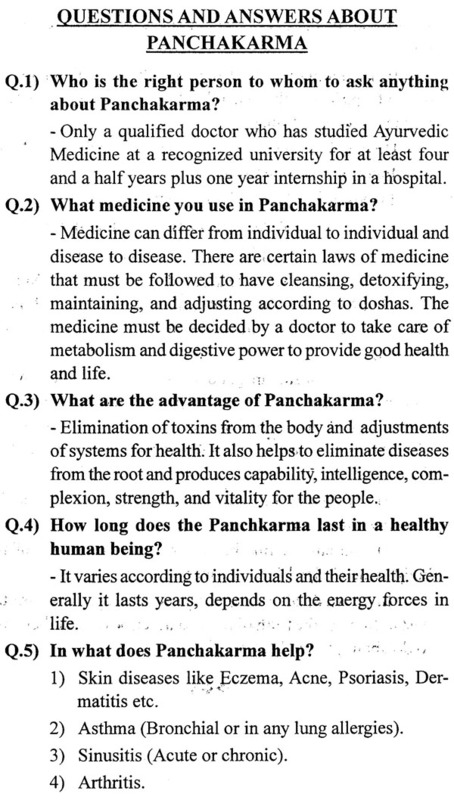 Panchakarma should be given by a docter. If not, is not good to take it. Three month to one year training is not enough. This procedure can be used all over the world under the supervision of a docter. Usually a docter knows how to deal with people's health and the treatment. Ayurvedic medicine only deals with the root cause, in stead of treating sign and symptom. Thinking: what to think and how to implement it. 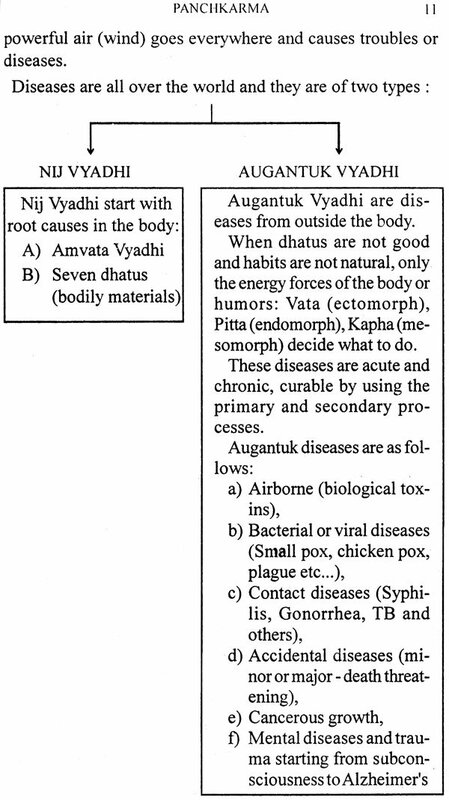 Ayurvedic medicine emhasizes more on health to eliminate diseases. Everyone should Follow the points to get good health and the rest follows after. Panchkarma maintains health, corrects behavior and mind. Everything is decided by energy forces (humours). Nature is powerful and does not give any chance of amalgamation in food at the cost of health. Ayurvedic medicine does not follow any other medical system and never allowed any medicine to be produced in mass for a mass of people. Now we are living in a modern era which is full of illusion. Countires in some number they like new ways of life. They are OK until they do not touch the food and lifestyle. In case if they touch the food with preservation, chemical and artificial means, Ayurvedic Medicine advises them not to do anything with food at the cost of health. Only nature is always right and permits us to do things and be happy the way we want. People are attached with illusion and artificials things which will pay according to their actions. Ayurvedic medicines wants to protect people's health and heal 1.7 billion People out of India and there are according to their karmas (actions). One may think about modern medicine and its science and technological development to have progressive growth and then treatment. Panchkarma follows that. Vichar= How to Impement it. That all possiblity keeps away from diseases. Santan vahak =Sperm & Ovum. (Reproductive System). When Dhatus (Bodily Materials) are healthy, they function normally and produce Oja or Aura or Grace to live in the boundary of immune system and its main key "self body resistance" which is responsible of life and is given by mother at the time of birth.